The following is a story that is sure to warm your heart. We are proud to introduce Lateefa, who has been involved in the veterinary community for over 20 years. With a heart as big as gold, Lateefa couldn’t help but beam as she described her story to us… Last August, Lateefa was at the Redbank Veterinary Hospital in New Jersey for a client visit when she bumped into the head doctor of the facility. It had been a few years since her last pup, a German Shepherd / Collie mix, and she was finally coming around to inviting another into her home. “I’m thinking about fostering a German Shepherd!” she told the doctor. “Oh geez, don’t do it. You know better than anyone else how exhausting it can be. Are you sure you’re ready?” he replied. But there had been an absence of love in her house without a pup, and besides, “If I was going to foster a dog, it’d have to be a dog that really needs me and my expertise, right?” thought Lateefa. And so, she decided to give the gift of her love and care to a pup in need. Lateefa knew that whatever dog she ended up fostering, it was likely that food was going to be an important factor on the road to recovery. So, the doctor at Redbank connected her with Dr. Lisa Weeth, a leading veterinary nutritionist at the hospital who could help advise on the proper food to get her future foster dog eating again. As it turns out, Dr. Lisa Weeth was one of the nutritionists who helped create the original Freshpet formula. To this day, we still work closely with Dr. Weeth on ingredients, nutritional consultation and recipe ideas to ensure your dogs and cats are getting everything that they need. See where this story is headed? Enter Jude. Jude was picked up as a stray on the streets of Helmetta, New Jersey. 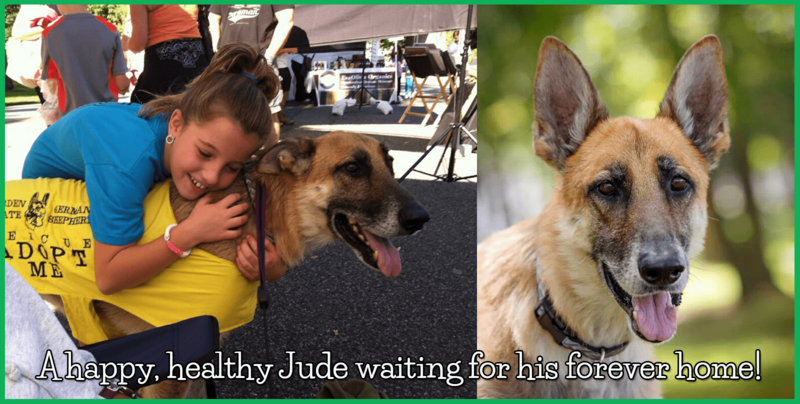 Jude was believed to be an eight-year-old German Shepherd, weighing in at a dangerously frail 50 pounds – half the healthy body weight for his breed and age. Jude found his way to the Garden State German Shepherd Rescue (GSGSR) in Millburn, New Jersey. A few days later, Lateefa got the call. Having been told about Jude’s condition, Lateefa was nervous and hopeful that she was up to the task. Jude was pretty much barren of any fur from his rib cage to his tail, with a bulging spine from malnutrition. Lateefa had been told by GSGSR that Jude was struggling to eat, but with Dr. Lisa Weeth’s advice about feeding Freshpet in mind, Lateefa was optimistic. At 2pm on August 8th, 2013, Lateefa met GSGSR to pick up Jude, and braced herself as they opened the car door. Right away, she thought to herself, “Oh my God…he’s got Mange, too.” Aside from a lack of fur, decrepit body and wounded morale, Jude couldn’t receive physical affection because of his lesions. While he may have looked at Lateefa with the gentlest eyes you can imagine, “In 31 years, I have never seen a dog as emotionally broken as Jude,” uttered Lateefa. He seemed eager to get into her car, and from there the two drove home together. Lateefa simply tried to make Jude comfortable for the first few days. With Dr. Weeth’s nutritional advice in mind, a low-fat, high-protein, high-fiber diet was just what Jude would need to find his appetite and put on body weight to aid in his physical and emotional recovery. So, Lateefa pulled out a roll of Freshpet Vital Beef and Bison from the fridge and waited with anticipation to see if Jude would take to it. Within minutes, the dog that struggled to eat while at GSGSR took right to his new fresh, all natural food. 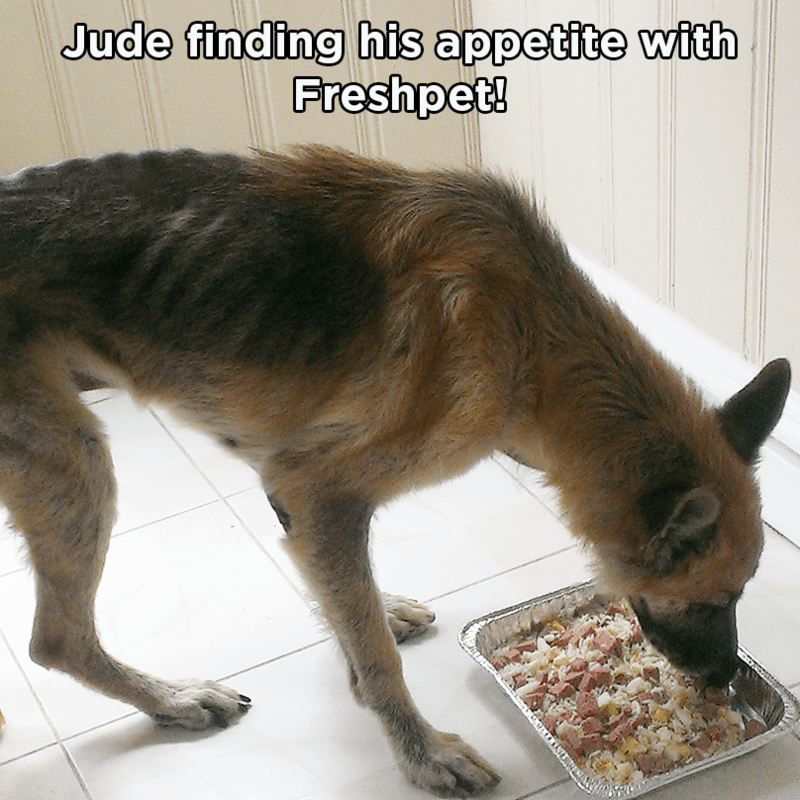 “I love the fact that Freshpet is a natural diet,” says Lateefa, “and for the first few weeks I would feed him ¼ pound of Freshpet with a boiled egg and rice six times a day, just to get his weight up.” Finally, Jude was getting into a healthy eating routine. It didn’t take long for Lateefa to begin to notice a change in her Jude. “I genuinely believe that it was his love for food, his Freshpet, that brought him out of his broken state,” says Lateefa. Jude’s favorite Beef and Bison, along with Lateefa’s amazing communication and one-on-one interaction, is what boosted Jude’s weight and lifted his spirit. With Jude eating again, Lateefa got another stroke of luck early in her fostering of Jude. 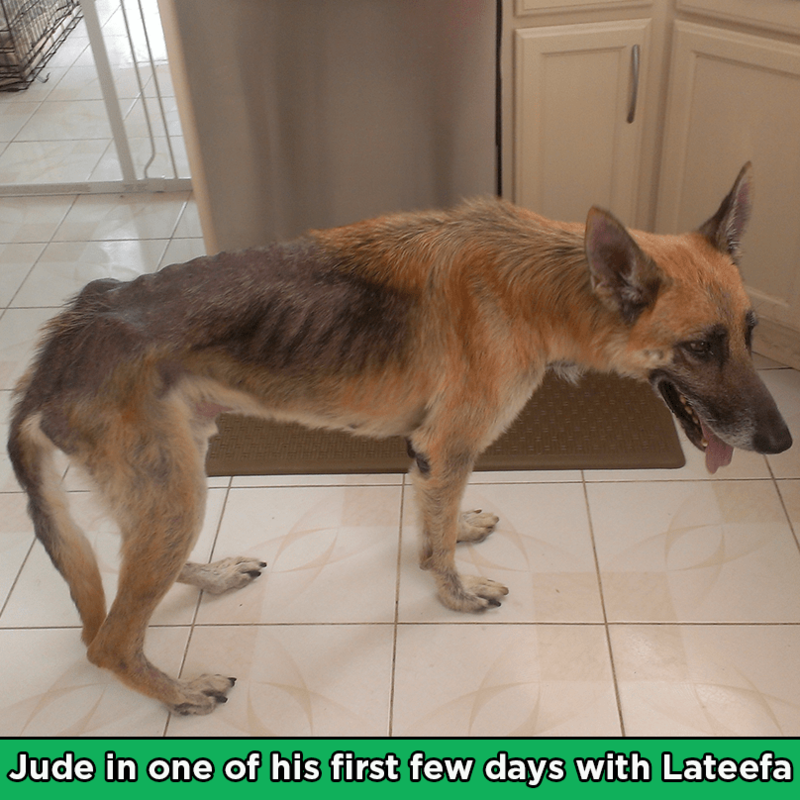 Lateefa had kept in touch with the GSGSR to let them know how Jude had been doing, and was so pleasantly surprised to hear that Freshpet had recently donated over 800 pounds of Vital dog food to their shelter. “We haven’t had to buy a roll yet, all of Jude’s food has been donated from Freshpet,” remarks Lateefa. “He’s absolutely in love with beef and bison – he freakin’ loves it!” In fact, Jude loves his Freshpet rolls so much that he won’t touch kibble if Lateefa tries to mix it in, “He just picks out the Freshpet.” Today, Jude is now over 90 pounds, with a full coat and is finally showing his true personality. “He barks at the deer now – that’s a sound I wasn’t sure he would even make,” says Lateefa. The former stray who suffered from physical and emotional heartbreak, with signs of obvious physical abuse from previous owners, now runs and wines and jumps and nudges you for attention…and his food. “He’s now such a foodie,” says Lateefa, “so much of his happiness came from his food. I really think his Freshpet made all the difference.” Today, Jude is available for adoption and looking for a forever home that can provide him with the same love and care that Lateefa has so generously given. Thank you Lateefa and GSGSR for the amazing work you've done to get Jude back to his normal self, and we can't wait to hear more about how Jude is doing in the near future! Do you have a Freshpet Story you'd like to share? Or do you want to learn more about how we work with shelters across the country? 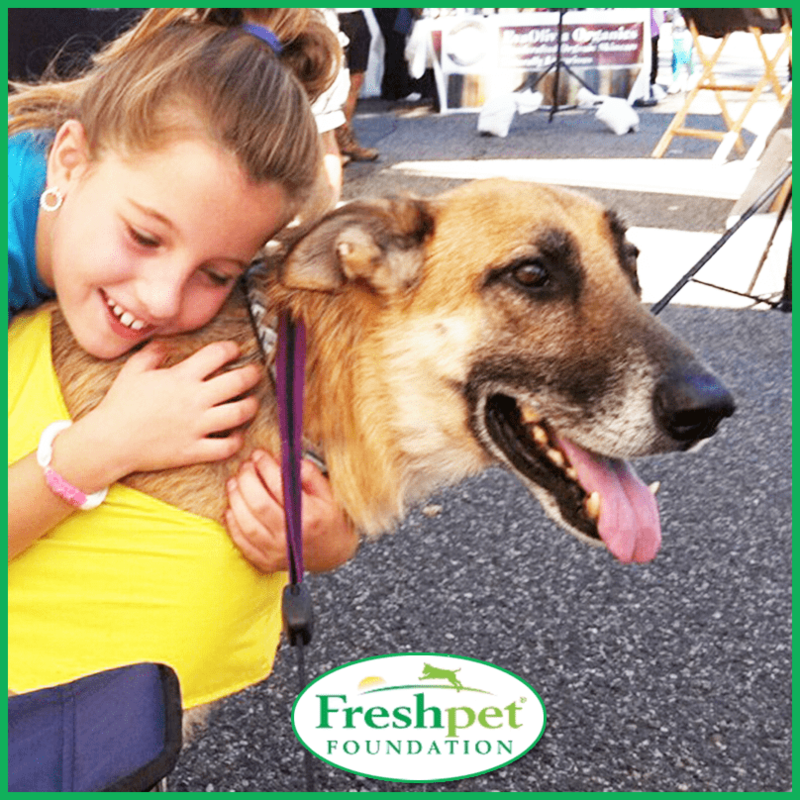 Write a review of your favorite Freshpet recipe or visit our Charitable Donations page at Freshpet.org.